Colombo City Trail – LDR Technologies Lanka (Pvt) Ltd.
Fort is the central business district of Colombo in Sri Lanka. 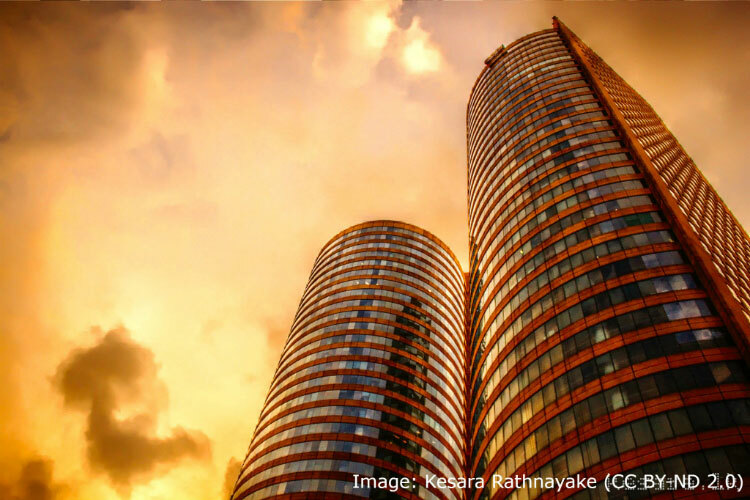 It is the financial district of Colombo and the location of the Colombo Stock Exchange (CSE) and the World Trade Centre of Colombo from which the CSE operates. It is also the location of the Bank of Ceylon headquarters. 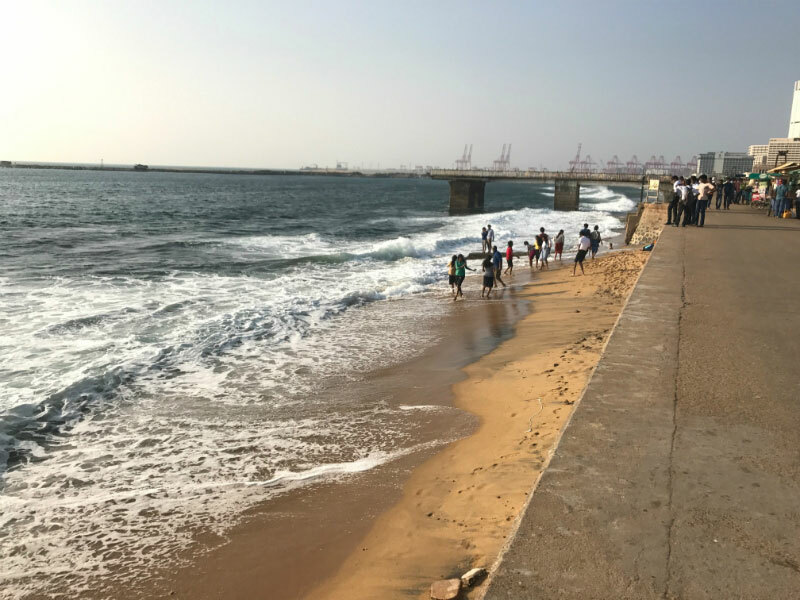 Along the foreshore of the Fort area is the Galle Face Green Promenade, built in 1859 under the governance of Sir Henry George Ward, the Governor of Ceylon (Sri Lanka) during British colonial administration. Fort is also home to the General Post Office, hotels, government departments and offices. Check them off one by one! Built as a hospital by the Dutch, it has been used for several different purposes, over the years. It is believed to have existed since 1681, as recorded by German Christoper Schweitzer. It is now a heritage building and a shopping and dining precinct. Floating market is situated at Outer-Fort(Pita Kotuwa), Visit there and do some shopping and see the shops on boats. Jami-Ul-Alfar Mosque was built in 1909 by the Pettah Muslim community to fulfill their required five-times-daily prayer and Jummah on Fridays. It is one of the oldest mosques in Colombo. Before other landmarks were built, some claim that the Jami Ul-Alfar Mosque was recognized as the landmark of Colombo by sailors approaching the port. 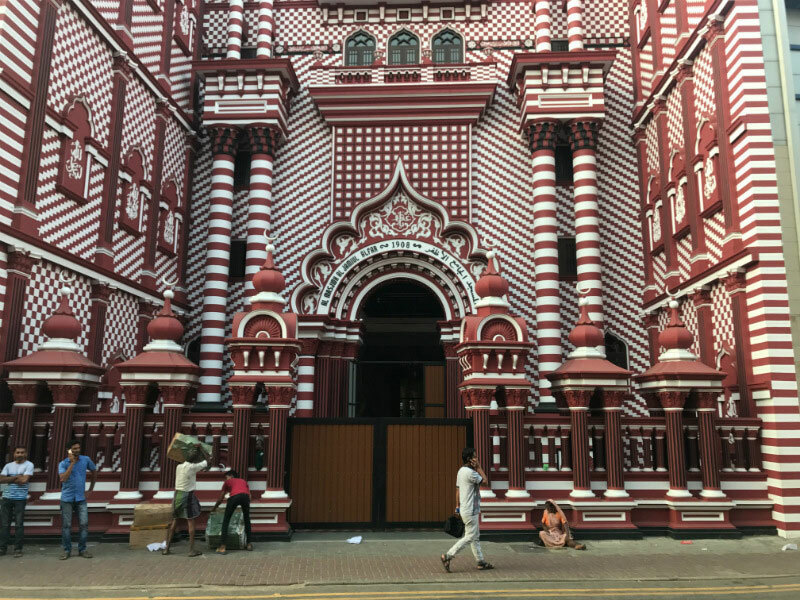 In the hustle and bustle of Pettah, Colombo’s core commercial district, is situated a most striking building, a spiritual haven called Jamiul Alfar Masjid. This mosque is remarkable because the architecture is Indo-Saracenic, incorporating pomegranate-shaped domes. But the most extraordinary feature is that each brick is painted red or white and used in contrasting designs, which gave rise to its common name, the Red Mosque. Before entering the mosque, do remember to remove your shoes and place them on the rack outside! When entering mosque, you should wear a proper dress which covers your body. Ladies should cover their arms and hair too. Take a photo in front of mosque (don’t turn your back to mosque) and upload it to Instagram or to Facebook with #LocoMole. 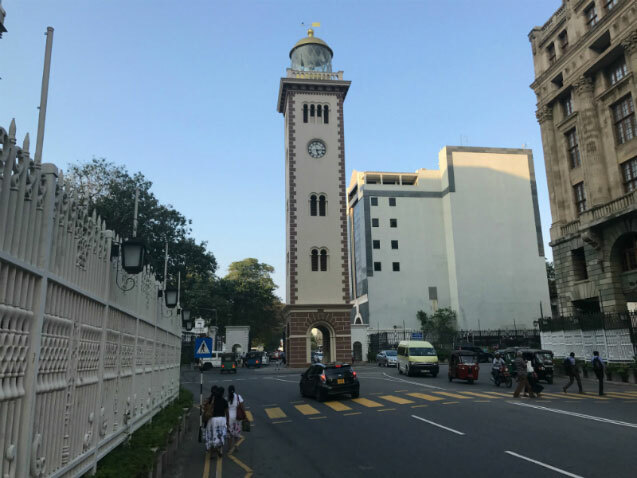 Old Colombo Lighthouse or Colombo Fort Clock Tower is a clock tower and was a lighthouse in Colombo. The lighthouse is no longer operational, but the tower remains and functions as a clock tower. It is located at the junction of Chatham Street and Janadhipathi Mawatha (formerly Queens Road) in Colombo fort. The tower was constructed as a clock tower in 1856-57 and completed on the 25 February 1857. The tower was designed by Emily Elizabeth Ward, the wife of Governor Sir Henry George Ward (1797 – 1860). The construction was undertaken by the Public Works Department, under the supervision of Mr. John Flemming Churchill (Director General of Public Works). The 29-metre-high (95 ft.) tower was the tallest structure in Colombo at that time. The original clock was commissioned for ₤1,200 in 1814 by the then Governor Sir Robert Brownrigg (1759 – 1833) but was kept in a warehouse, due to economic reasons, until 1857 when it was finally installed. The lighthouse was deactivated after its light became obscured by nearby buildings and was decommissioned on 12 July 1952. The modern Galle Buck Lighthouse was erected on Marine Drive as its replacement. Go to new lighthouse at the marine drive. 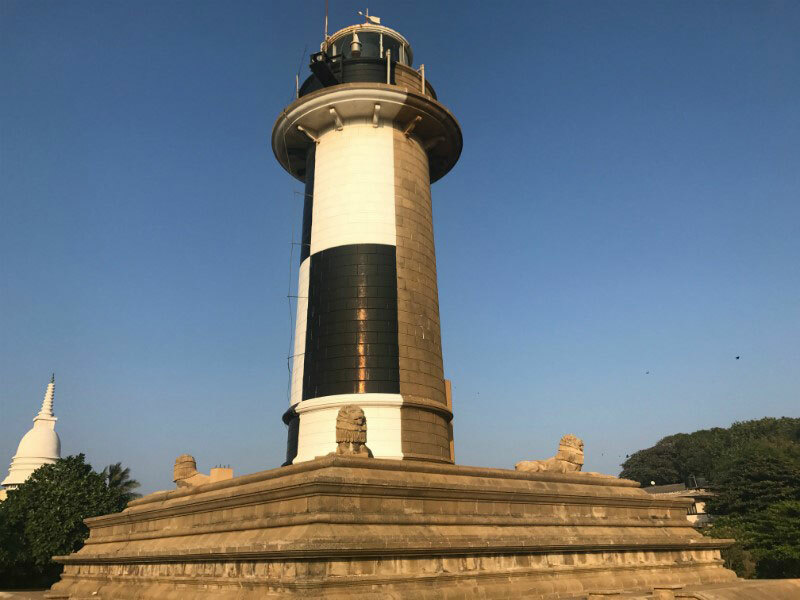 The current 29-metre-high (95 ft.) lighthouse was built in 1952 after the Old Colombo Lighthouse was deactivated when its light became obscured by nearby buildings as part of the Colombo Harbor Expansion project. It was opened by Rt Hon D.S. Senanayake, the first prime minister of Ceylon. Built on a concrete base which is 12 m (39 ft.) high, it has four statues of lions at its base. Due to the panoramic view of the Indian Ocean it offered, it became a city landmark. With the escalation of the Sri Lankan Civil War, public access to the site was restricted. 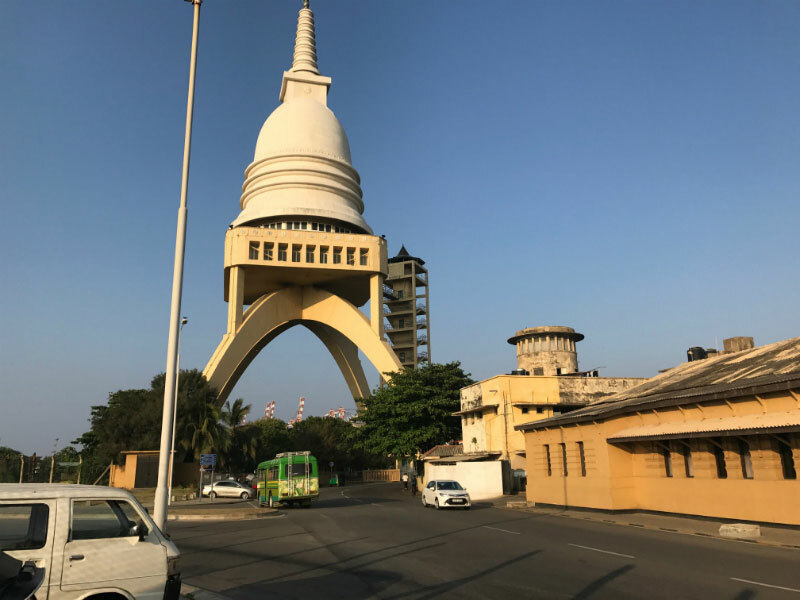 This was due to its placement in a high-security zone as it is across the street from the Naval Headquarters and close proximity of the Port of Colombo. Located at its base is a naval gun battery that is used by the Sri Lanka Navy for its traditional gun salutes. By tradition the Navy accords a 25-gun salute to the nation on the National day, which is 4 February each year. It began with HMCyS Vijaya of the Royal Ceylon Navy, the first warship of the navy according a 25-gun salute on 4 February 1951 with its single 4-inch gun. In 1952 two 4-inch guns where brought from the United Kingdom in preparation of the Royal visit of Princess Elizabeth, which did not occur as she returns half way due to the death of her father the King. Since then the guns are mounted at the lighthouse and fire the gun salute. Three more 52 mm guns were added in 2000 as gifts from the Indian Navy which now fire the gun salutes. Once you got on to the concrete base you can see the Sambodhi Chaithya clearly. Take a panorama photo of the beach. Try to chapter beach, harbor and the further Port city to your photo. Sambodhi Chaithya (also sometimes called Buddha Jayanthi Chaithya) is a stupa, a Buddhist shrine, built with reinforced concrete. The stupa is located in Colombo Harbor, Sri Lanka. Before entering the temple, do remember to remove your shoes and place them on the rack outside! When entering temple, you should wear a proper dress with light color. You will see beautiful attractive seen of Colombo harbor and sea site, try to capture them as memories. 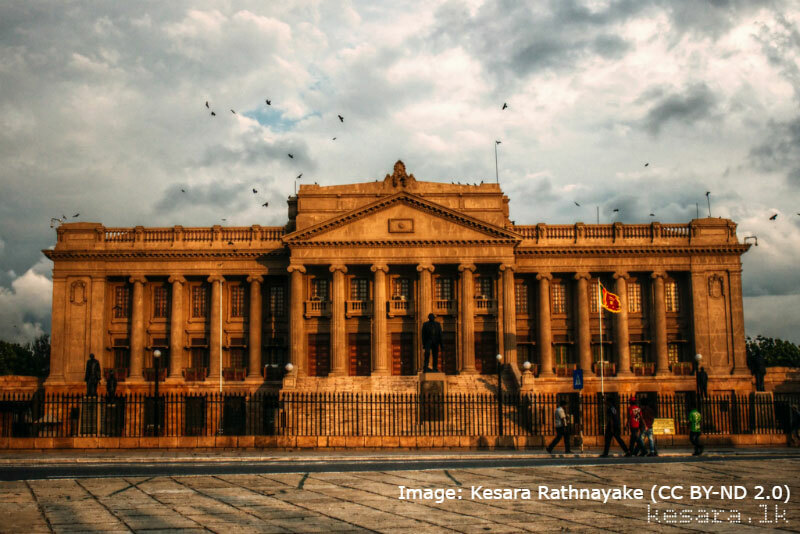 The Old Parliament Building, is the building that houses the Presidential Secretariat of Sri Lanka. Situated in the Colombo fort facing the sea, it is in close proximity to the President’s House, Colombo. The building houses the island’s legislature for 53 years until the New Parliament Complex was opened at Sri Jayawardenepura in 1983. You will not able to enter this building just check it out from the road. The Old Parliament Building, is the building that houses the Presidential Secretariat of Sri Lanka. Situated in the Colombo fort facing the sea, it is in close proximity to the President’s House, Colombo. The building houses the island’s legislature for 53 years (1930 – 1983) until the New Parliament Complex was opened at Sri Jayawardenepura in 1983. There are some statues in front of the building try to take some good photos. 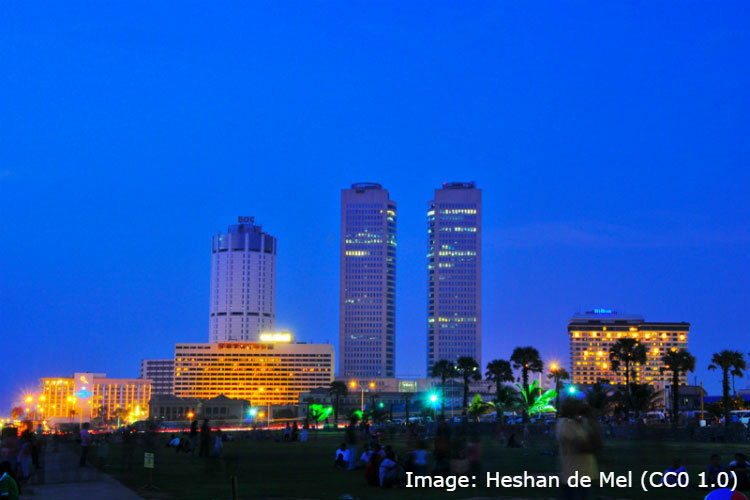 The Galle Face is a five-hectare ocean-side urban park, which stretches for a half kilometer along the coast, in the heart of the financial and business district of Colombo, Sri Lanka. The promenade was initially laid out in 1859 by Governor Sir Henry George Ward, although the original Galle Face Green extended over a much larger area than is seen today. The Galle Face Green was initially used for horse racing and as a golf course, but was also used for cricket, polo, football, tennis and rugby. Galle Face Green originally extended over a much larger area than exists today. Records indicate that it was bounded to the north by Beira Lake, the ramparts of Colombo Fort and the city’s cemetery, to the west by the Indian Ocean, whilst to the south by the Galle Face Hotel (established in 1864, although the original building on the site was a Dutch villa) and to the east by St Peter’s Church (consecrated in 1821). You can get down to beach using steps, then remove your shoes and feel the warmth and the friendly touch of sea. Try to find a seashell too. There are many small shops with spicy foods, try some of them. You can buy a kite for a little money and try to fly that, this will be a very enjoyable. Go to Observation Deck and see fishes, sunset and try to take a 360° video. The temple’s architecture demonstrates an eclectic mix of Sri Lankan, Thai, Indian, and Chinese architecture. This Buddhist temple includes several imposing buildings and is situated not far from the placid waters of Beira Lake on a plot of land that was originally a small hermitage on a piece of marshy land. It has the main features of a Vihara (temple), the Cetiya (Pagada) the Bodhitree, the Vihara Mandiraya, the Seema malaka (assembly hall for monks) and the Relic Chamber. In addition, a museum, a library, a residential hall, a three storied Pirivena, educational halls and an alms hall are also on the premises. Don Bastian (de Silva Jayasuriya Goonewardane, Mudaliyar), a famous 19th century shipping merchant who was looking for a suitable land to build a temple for the Matara Sri Dharmarama thero, bought a beautiful piece of land belonging to three Moors, and filled and prepared the land at great expense. The land bordered on two sides by the Moragoda Ela and the Pettigala Ela was used to build the temple, which was subsequently named the Padawthota Gangaramaya Viharaya. The Mudaliyar, with the assistance of the people built a great ‘Chaitya’ (Dagaba) of 30 Riyans, and built a great decorative arch (thorana) and a ‘Sandakada pahana’ modeled on the ones found at Anuradhapura, at the entrance to the temple. A ‘Bo’ sapling brought from the great Sri Maha Bhodiya in Anuradhapura, was also planted by his own hands and brought up. He also built a three-storied preaching hall and the walls, railings and the moat round the temple. Today Gangaramaya serves not only as a place of Buddhist worship; it is also a center of learning. The temple is involved in Buddhist welfare work including old peoples’ homes, a vocational school and an orphanage. The temple is uniquely attractive and tolerant to congregation members of many different religions. 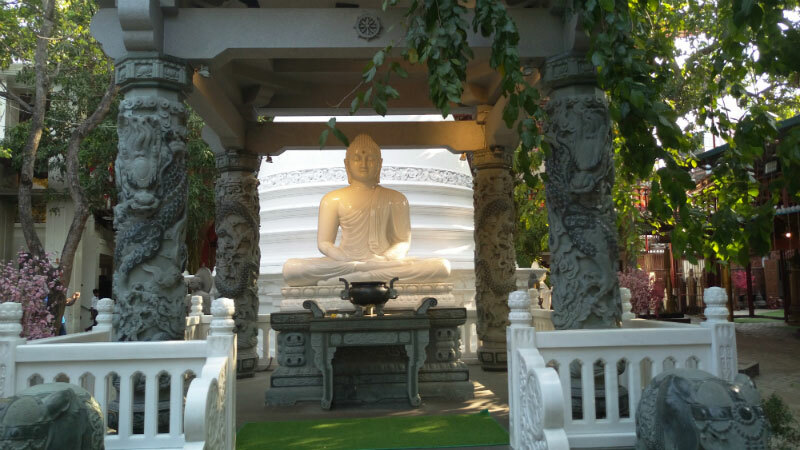 It has also been instrumental in establishing the Buddhist temple on Staten Island (U.S.A.) the Buddhist Center in New York and the Buddhist Centre in Tanzania, thereby helping to propagate the Dhamma in other countries. Seema Malaka (Sinhalese: සීමා මාලකය) is a Buddhist temple in Colombo, Sri Lanka. The temple is mainly used for meditation and rest, rather than for worship. Situated in the Beira Lake, the temple was originally constructed in the late 19th century. Seema Malaka is a part of the Gangaramaya Temple and is situated few hundred meters to its east. Once you go to near to BO Tree, there will be a staircase, take it and go to the museum. Don’t use your camera inside the museum. This is Situated in the Beira Lake, which is on the way to Gangarama temple and this is also a part of temple. This is situated near to Seema Malakaya in the middle of the lake. Take something to feed ducks in the park.